This "Historically Speaking" column appeared in the Exeter News-Letter on Friday, September 1, 2017. There’s an 1895 eighth grade final exam from Selina, Kansas, circulating around on social media that seems to reappear every year about the time our public schools open. The subtle message it carries is that educational standards have fallen in recent decades. Are our modern children hopelessly undereducated in comparison to the children of Kansas in 1895? The answer is more complicated than it may seem. The exam itself has questionable origins and can be ascribed as an eighth grade final, a high school final or possibly a teacher’s exam. The five hour test covers subjects in the areas of: grammar, arithmetic, history, orthography (spelling and word use) and geography. The questions are difficult for a modern person to answer. To some degree, this is because we’re not steeped in eighth grade studies at the moment. Education doesn’t simply dump information into the brain that can be retrieved at any time. Most of us would be hard put to, “Give nine rules for the use of Capital Letters” even though we use capital letters all the time. Kids back in the 1890s learned material by rote memorization. Some of that stuff sticks with us – I can still recite the planets, even though I insist on including Pluto – but most memorized information falls away from our working memory over time. Speaking of planets, there’s no science in the eighth grade exam. The closest the students got was in the geography section, “Of what use are rivers? Of what use is the ocean? How do you account for the extremes of climate in Kansas?” The arithmetic section is limited to basic calculations and, as the name implies, doesn’t include any other branch of mathematics such as algebra or geometry. Eighth grade students today are introduced to higher skills at a much younger age. But then, today we generally don’t need our 13 year olds to figure out, “A wagon box is 2 feet deep, 10 feet long, and 3 feet wide. How many bushels of wheat will it hold?” However, they can probably alphabetize and manipulate an excel file if you ask them. We don’t have an example of a similar exam for Exeter in 1902. The girls entering the Robinson Female Seminary had to take exams and it would be wonderful to know what exactly was expected of them. 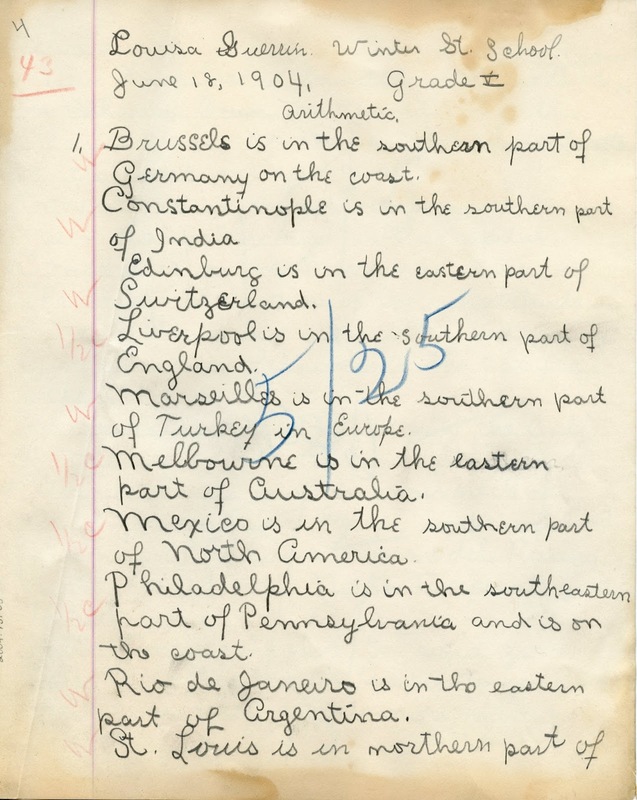 We do have two examples of geography tests given to fifth-graders at the Winter Street School in 1902 and 1904. The tests were found in a house on Front Street in 2004. The teacher was Miss Sara Tilton. Most of the questions stick to the teaching formula of memorization, “What are the chief agricultural products of Brazil? Name in order, beginning at the north, the five important peninsulas of Europe. Describe the location of each of the following cities: Budapest, Buenos Aires, Geneva, Hamburg, Liverpool, Moscow, Paris, Rome, Valparaiso.” As a former teacher, I was puzzled by the scope of both tests. The questions are all over the place, asking about Europe, South America, climate zones, geographical features and industry. A more modern approach would treat each of these separately. The students were given a mere seven questions to prove their mastery. Perhaps this is why most of them failed miserably. We have six examples of the student’s work. In one regard they excelled – all of them managed to follow the directive “make each statement a complete sentence.” But although, “Edinburg is in the eastern part of Switzerland” is a complete sentence, it is nonetheless totally wrong. In answer to, “What is the occupation of most of New Hampshire’s inhabitants?” the kids were uncertain: “farming and grazing,” “manufacturing and farming,” “making of boots and shoes, cotton cloth.” The major products they listed included one boy’s answer, “flowers, cattle, cattle products, sugar.” Maybe he was thinking of maple sugar. 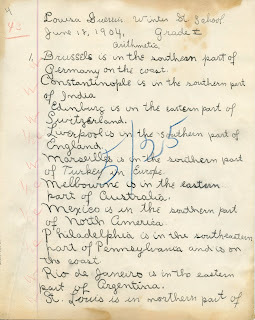 Miss Tilton didn’t accept his answer, but then he also wrote “Edinburgh is in the south western part of India” so perhaps his grasp of climate zones wasn’t particularly acute. Speaking of which, in 1904 there were five climate zones: north frigid zone, north temperate zone, torrid zone, south temperate zone and the south frigid zone. New Hampshire is in the north temperate zone. All the kids got that question right. All the students struggled with, “Bound the state of New Hampshire.” We are bounded on the north by Canada (or Quebec, as one student correctly answered), but they also listed Maine, which is only slightly correct, and the Arctic Ocean. To the south, the kids thought New Hampshire shared a border with Connecticut and Massachusetts. To the east is the Atlantic Ocean and Maine – a bit of a trick question because technically it’s both, and to the west some of them correctly said Vermont, but also New York and Canada. Most of them didn’t travel very far, so anything outside the state line was a mystery. Were students better educated one hundred years ago? They were certainly educated differently. Current students are asked questions that require them analyze information rather than just regurgitate facts. The history portion of the 1895 exam asks students to, “Relate the causes and results of the Revolutionary War,” and “Describe three of the most prominent battles of the Rebellion (Civil War).” I asked a current eighth grade teacher at the Cooperative Middle School for an example of a test question. “Using your knowledge of the terms FEDERATION and CONFEDERATION, explain how the South’s choice of government contributed to their loss in the Civil War, and how the Union was able to use its government more effectively to win the war.” Before you decide whether you’re smarter than eighth grader, you might want to find out what they’re actually learning today. Meanwhile, I need to go look up the “five important peninsulas of Europe.” Miss Tilton would be very upset if I come up short.